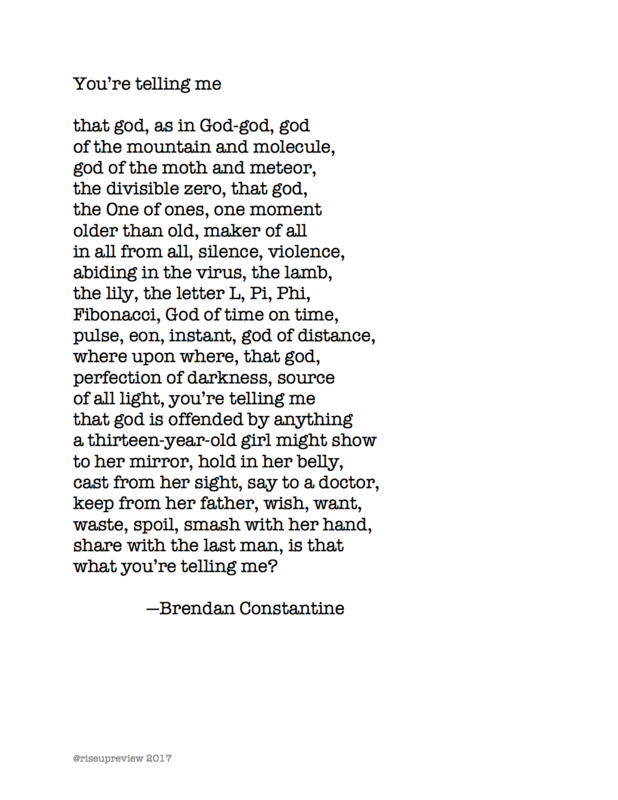 Brendan Constantine is a poet based in Hollywood. His work has appeared in numerous journals, most notably Ploughshares, FIELD, Zyzzyva, Ninth Letter, Poetry Daily, Verse Daily, ArtLife, PANK, and L.A. Times Best Seller, The Underground Guide to Los Angeles. His first book, Letters To Guns (Red Hen Press 2009), is now required reading in creative writing programs across the nation. His most recent collections are Birthday Girl With Possum (Write Bloody Publishing 2011), Calamity Joe (Red Hen Press 2012), and Dementia, My Darling (Red Hen Press 2016). He has had work commissioned by the Getty Museum and he has received grants from the James Irvine Foundation and the National Endowment of the Arts. He is currently poet in residence at the Windward School and adjunct professor at Antioch University. In addition, he regularly offers classes in hospitals, prisons, shelters, and with the Alzheimer's Poetry Project.